Salt Lake City’s industrial community is alive and well. For more than a decade, Area 51 has been the lifeblood of Utah’s goth, industrial, synthpop and EBM community. 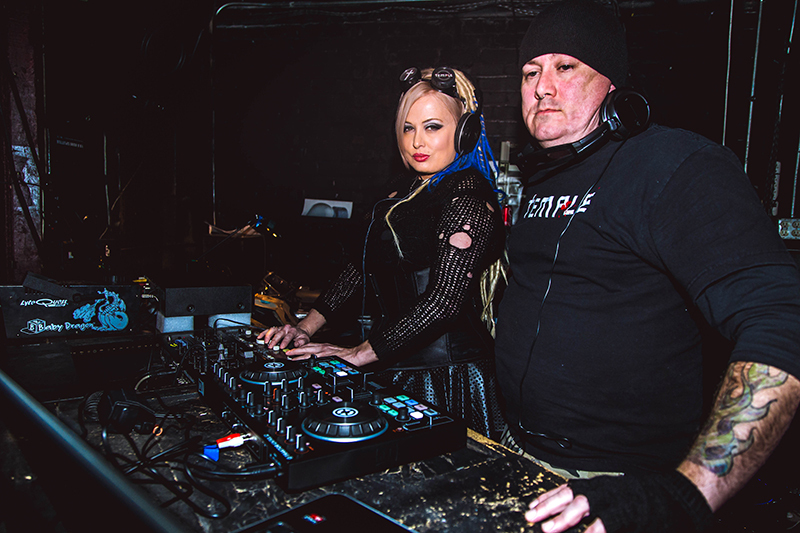 On Jan. 20 at Area 51, DJ Mistress Nancy and Reverend 23 will host the two-year anniversary of Temple, a community-based get-together for the fans of industrial, electronic, goth and all that dwells in between. Mistress Nancy and Reverend 23 started Temple at Metro Bar before moving it to Area 51 as a weekly Wednesday-night event. “Temple is about community and bringing people together and providing them music to match the atmosphere of the club,” she says. “If it is a slow night and no one is on the dancefloor and people are having a conversation, I will usually play something more atmospheric. If the dancefloor is full and people are really excited, I will usually play something that suits that mood.” Oftentimes elsewhere, the set list is the set list, and the consideration of the crowd is almost never taken into account. Mistress Nancy covers all bases with what she plays at Temple; everything from KMFDM, VNV Nation, Wumpscut and Frontline Assembly to newer acts like Chant and Author and Punisher. Live performances are also a fixture of Temple, and musicians expected to perform at the anniversary are CrimesAM, Sleep Clinic, Burst Therapy and Cervello Elettronico. This event offers the community of Temple a memorable evening intertwined with a unique experience and dosed with amazing live acts, all of which cater to the community that makes Temple possible. Spanning a couple of decades, Alvarado’s discography has grown, and Twilight Transmissions is currently taking hold of his time. “I have been a musician since the ’80s,” Alvarado says. “I started off in the punk scene then gradually went from genre to genre. Music, clubs and everything goes in cycles—the early ’00s and ’90s were a golden era, and at this time, the environment is currently going through some changes.” Having written about and appreciated Alvarado’s music, Nancy asked him to play Temple’s anniversary showcase. It seems, in the Salt Lake industrial community, that no one is further than six degrees of separation from each other. Communities only thrive when people get involved. Area 51 is not a flash in the pan—this club has stayed around for a reason, and that reason is that it offers special events like Temple, Fetish Night and live bands like Aesthetic Perfection. As time changes, some things remain a constant—the Utah industrial community is a constant, Area 51 is a constant, and Temple looks like it will be a constant because of the community behind it. There is nothing better than going out on a Wednesday and eliminating the heaviness of Monday and Tuesday by having a drink, speaking with like minds and listening to an eclectic mix of industrial electronic music. Take a break from your week, and check out Temple at Area 51.